It is recommended that you take a shower or bath the night before or the morning of your injection day, as it is important to keep water out of your eye for three days after your injection. Prior to injection, your ophthalmologist will clean around your eye with a dilute iodine solution to reduce the small chance of infection. A metal speculum will be used to hold the eyelids open so you won’t have to worry about blinking at the wrong time. 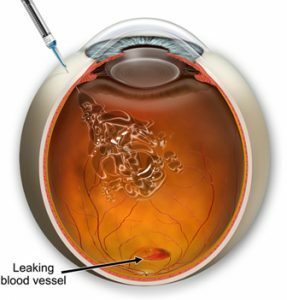 A small amount of local anaesthetic may be injected into the outmost layer of tissue on the eye. Next the medication will be injected into the eye with a very fine needle. The speculum will then be removed and you will be done! The whole procedure takes less than five minutes. if you have glaucoma, Your ophthalmologist may check your intraocular pressure a couple of hours after the injection. After your injection you will be instructed not to rub your eye or get water in your eye for three days. If you have any problems like decreased vision, something dark coming in from the edges of your visual field, or pain in the eye, you should call the office as soon as possible. If your problem occurs after office hours or on the weekend, you should go to the Emergency Department nearest you. Most patients have a little discomfort from the iodine or the speculum, and most patients receiving kenalog injections can see the drug floating around in the eye; it is very rare to have a serious problem from the injection. Your ophthalmologist will contact you after your injection to schedule your next visit, usually for 4-6 weeks later.